When we filmed the original pitch video for Noclip, I very intentionally inserted some shots of me playing Rocket League at home. This was always the project I wanted to launch Noclip with. Not only was it a fascinating modern video game story, but it was a story that stretched back a decade to one of my favorite games of all time, Unreal Tournament 99. We only spent one day filming interviews in San Diego (by comparison we spent 10 in Warsaw for The Witcher) but the compact nature of the story meant that we were able to spend a lot of time crafting beautiful spectator-cam footage of the game's environments, and filming some neat clips with our custom Rocket League RC car. 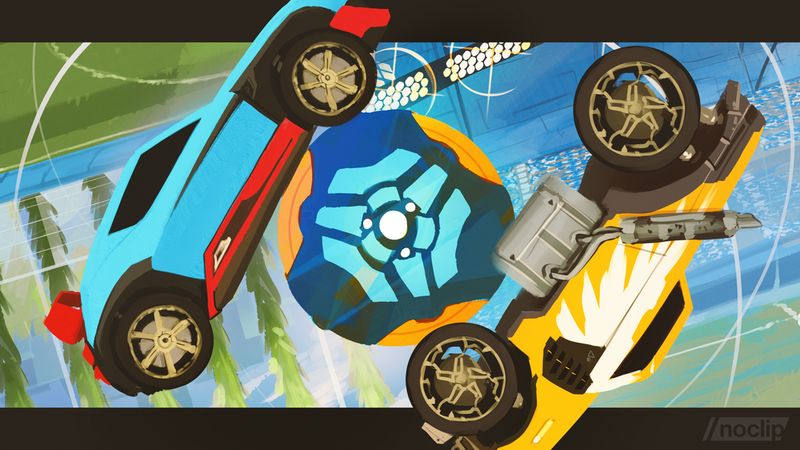 The end result was a tight, two-part series that tells the story of Rocket League's long road to development, and its eventual success in winning over gamers around the world. In part one of Noclip's look into the development of Rocket League, Danny learns how a mode in Unreal Tournament 2004 evolved into one of the most bizarre & compelling sports game of all time. In part two of Noclip's look into the development of Rocket League, Danny talks to Psyonix about the decision to go with PlayStation Plus, the disastrous server problems at launch and what success has meant to the studio. We commissioned artist Erica 'Aurahack' Lahaie to create a special piece of artwork to commemorate the launch of our first doc. It doubles up as a nice desktop background. Click the image to download the full version.